The Bega 77237/77238 LED bollard light impresses by its streamlined, rectangular form and its high-quality workmanship. With its noble aluminium and stainless steel surfaces it turns out to be a plain beauty from the outdoor lighting segment. The high-quality materials used enable the 77237/77238 LED bollard light to also be prepared for adverse weather conditions. The one-sided light emission aperture of this noble light fixture is enclosed with safety glass. The Bega 77237/77238 LED bollard light is available with a graphite or a silver look finish. Furthermore, the bollard lights from Bega are available in two versions; either with a screw-on base for mounting on foundations or with an anchorage unit for setting the luminaire in concrete. 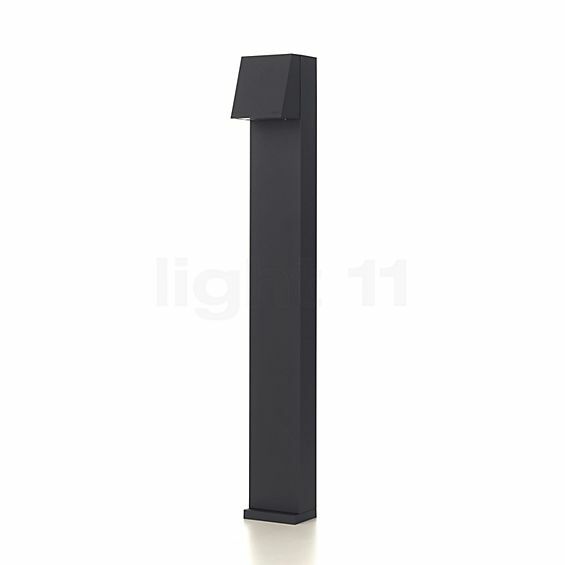 The Bega 77237/77238 bollard lights impress by a slim shape and discreet surface finishes. The purist Bega 77237/77238 directs its efficient LED light downwards and thereby illuminates paths and house entrances. Due to the safety glass the Bega 77237/77238 LED bollard light emits dimmed, soft light onto the floor area in front of it. Its focused light allows for a uniform and glare-free illumination. Here, it operates in an extremely energy-efficient way as it is equipped with modern LED lamps: the light-emitting diodes used fulfil the requirements of energy efficiency class A. With a power input of only 2.1 watts this bollard light supplies a light intensity of 280 lumens – this is more than a conventional 25 W incandescent lamp is able to achieve. As the Bega 77237/77238 LED bollard light is designed in accordance with protection type IP64 (dust-proof and protected against splashing water) it has everything it takes in terms of safety for use in outdoor areas. In combination with durable LED light sources and solid workmanship, the 77237/77238 LED bollard light is ideally prepared to provide long-term services even when exposed to wind and weather. Tell other customers and us about your experiences with the 77237/77238 - bollard light LED ! Thanks to its discreet, purist look, the Bega 77237/77238 LED bollard light is an enrichment to outdoor areas even while the light is switched off. The unobtrusive surface finishes emphasise the elegant impression. This luminaire is primarily used for paths, terraces and house entrances. Here, its pleasant light ensures a reliable orientation and therefore also provides for an increased level of safety. Speaking of safety: with regard to the rising number of burglaries an illuminated house entrance or driveway may also serve as a deterrent for unwanted guests.